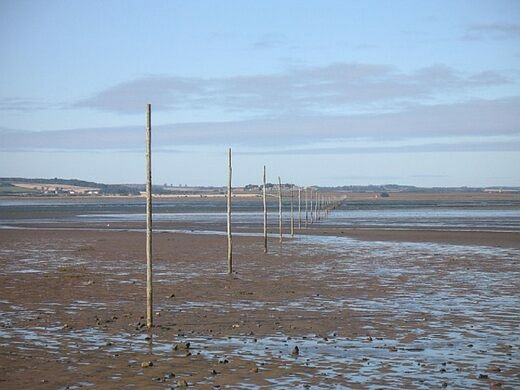 Twice a day this ancient path disappears with the tides, leaving the Holy Island of Lindisfarne out to sea. The Holy Island of Lindisfarne is down the Northumberland coast from the border of England and Scotland, not too far from Edinburgh. Except for a few hours, twice a day, it is isolated by the tides. 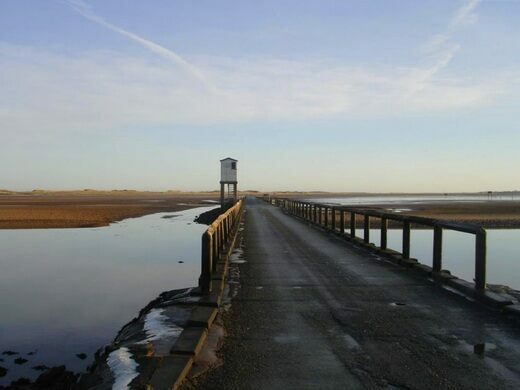 When the waters recede, there is a causeway for cars, bikes, and walkers, but for intrepid and inspired hikers there is another, ancient, route to the island: through the sands and mudflats, via the Pilgrims Way. Decaying 18th-century church converted to a single-family home. A lone pole once used to display a man's corpse now stands empty, but the memory remains. Covering a mere thousand acres at high tide, the island measures only three miles across. The nearest point to the mainland is about a mile from the shore, accessible over the paved causeway constructed in the mid-1950s. 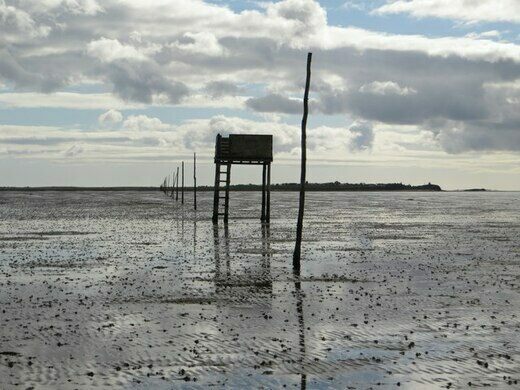 Until then—for 1,300 years—the Pilgrims Way footpath, marked with a line of upright poles, was the only access to the island. 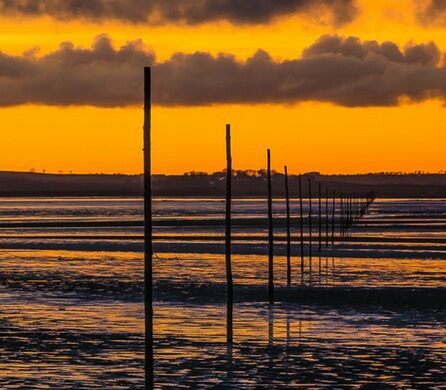 The semi-dry route comes by its pious name honestly, as some have claimed the island to be one of the most important religious sites of Anglo-Saxon England. 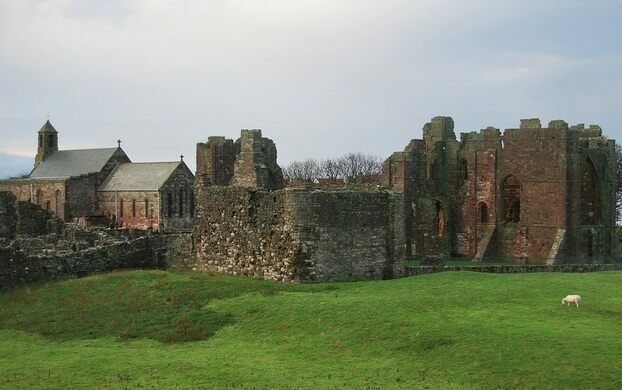 Lindisfarne’s original monastic community was founded in 635 CE by St. Aidan, an Irish monk from Iona, Scotland. This was during the period of Northumbria’s conversion to Christianity, and the monks here prospered. But by the end of the eighth century, the wealthy little island became a favorite target of Viking raiders, driving the order off. They didn’t return for 400 years. But return they did, and beginning in the 12th century the island prospered as a religious site again, until Henry VIII’s dissolution of the monasteries in 1537. After this, the old abbey was left to fall into ruins. 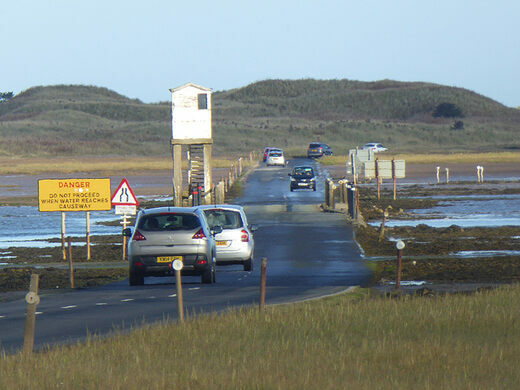 All access to the island is covered at high tide, including the causeway, and while driving it is a novelty, it’s not as much fun as following the old route. Be sure to start your crossing on a falling tide and keep to the marked path. Tide tables are displayed at each end—for both the causeway and Pilgrims Way. Once across, there is a small village, the historic abbey ruins, two lighthouses, a fishing harbor, and a castle high on a rock. 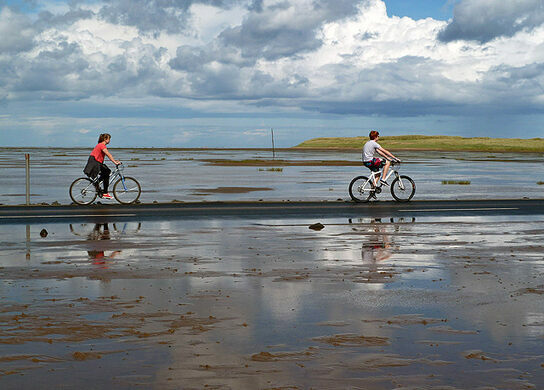 Holy Island is also important ecologically, surrounded by an 8,750-acre Lindisfarne National Nature Reserve. 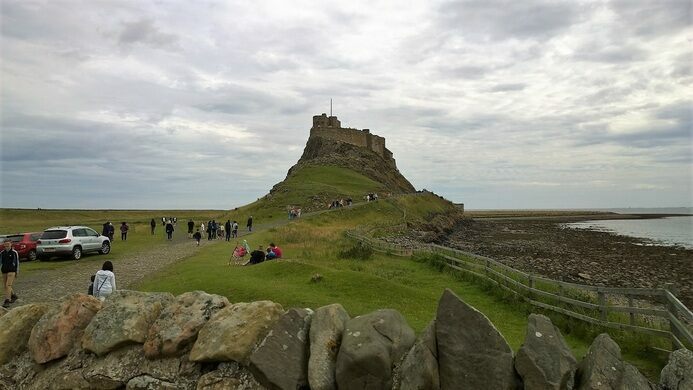 The Holy Island of Lindisfarne is part of the town of Berwick-Upon-Tweed, 70 miles (115 km) southwest of Edinburgh. 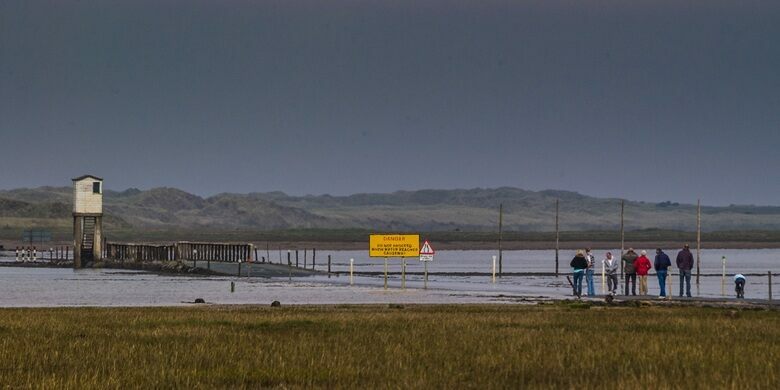 The causeway is open from about three hours after high tide until two hours before the next high tide, but the period of closure may be longer in periods of high winds. 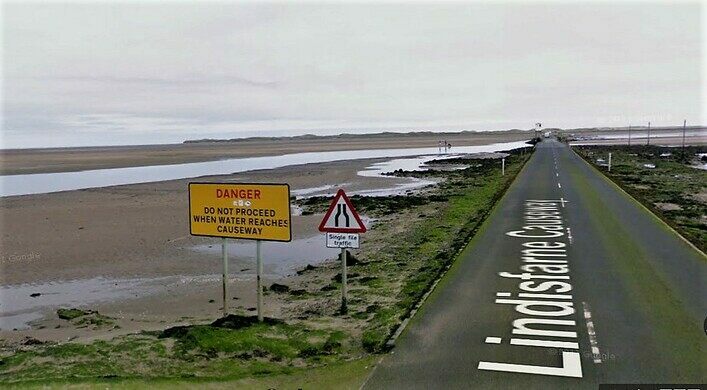 Despite the many warnings, about one vehicle a month is stranded on the causeway, requiring rescue by lifeboat, or RAF helicopter.Whether driving, biking, or walking, it’s imperative to get the timing right or risk getting stranded. 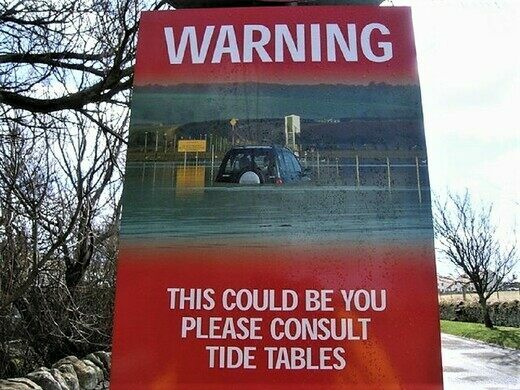 The tides can rise suddenly, so pay attention to the posted tidal notices (they differ slightly for the causeway and Pilgrims Way–make sure you’re consulting the right times). There are elevated safety refuge boxes along the path in case of mistiming, and there are also local guides to help visitors get it right. 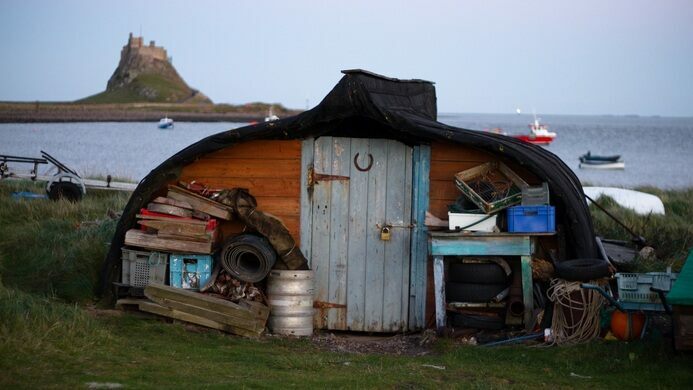 These upturned herring boats make nifty storage sheds for fishing goods. This museum honors the young maritime hero who became an unexpected Victorian-era celebrity. The medieval-looking hammer beam teak roof may be a Victorian vanity, but it's still absolutely magnificent.